There was one thing I did not mention in my previous post, the first day of Christmas Parade taping was hot. The funny thing about day two was the temperature dropped significantly. I went from jeans and a t-shirt to a coat and hat, so did the rest of the crowd. Day two started off with Clay Aiken singing at the Main Street train station with a bunch of the characters. He started at the top of the stairs then walked down towards Main Street. After the first take the director picked up his bullhorn. 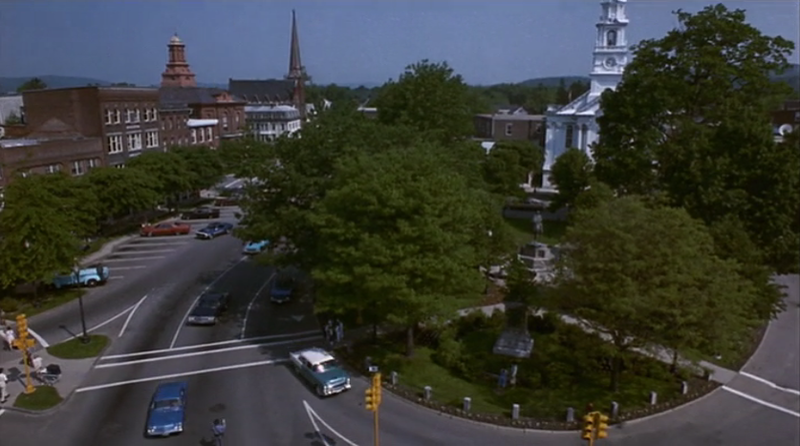 "I'm going to have to ask you guys to take your coats off, you see, when we filmed yesterday everyone was in shorts, it's going to look weird if the people at the train station are in coats and everyone on Main Street is in shorts." No one listened, it was too cold to stand there and pretend you weren't freezing. Clay finished his song and my roommates and I decided it was too cold to stand around so we headed back to Vista Way. Another early/warm morning at the Magic Kingdom. My friends and I decided to walk behind Main Street and see what was going on backstage. There were a few trailers set up in the parking lot so we approached one of the Disney VIP guides to see what was going on. He told us that Raven Symone was inside getting ready to film a segment in Fantasyland. He talked to us for a few minutes before asking if we were Cast Members. When he found out we were his attitude totally changed, he was borderline furious. Why else would we have been backstage? He warned us not to speak, wave, or look at Raven when she came out of her trailer. A few seconds later she emerged, naturally we waved. She waved back and said hello. VIP guy was pissed. They loaded her into and SUV and drove off, we headed over to FantasyLand to see what she was going to do. We beat her there and when she arrived saw us and asked "Hey, how did you guys beat me?" I probably don't need to tell you that VIP guy did not like this either. I'm pretty sure he tried to have us removed, but we weren't doing anything wrong. He just scowled at us the whole time. After Raven was done we headed back to Main Street to watch Regis and Kelly record their commentary. They were stationed at the end of Main Street just past Casey's Corner. We ended up standing right behind their podium, so if you have eagle eyes you could see me at 3 different parts of Main Street at the same time wearing 3 different outfits. By the time Regis and Kelly were taping their part all the parade floats had been filmed. Main Street was still lined with people though because they needed to see a crowd behind Regis and Kelly. Since there were no floats on the street everyone just started up at Regis. The director didn't like this. He jumped back on his bullhorn "When this airs on TV we are going to put the parade floats behind Regis and Kelly digitally, so I need you guys to pretend a parade is going down the street, wave to each other." The crowd followed these instructions for a few minutes but then focused all their attention back on Regis and Kelly, except when we all had to stare up at the sky and pretend to be waving at the Santa float. This concluded my life long dream of attending a Disney World Christmas Parade, it wasn't quite what I expected but it was worth it. There were obviously performances and floats I skipped because of the cold or lack of interest. One of those was Jump 5 (whoever they are), I also missed a second appearance by my baby girl Christy Romano, but I had my picture so I wasn't worried. It's Kind of a Cute Story: Book Review. If you haven't bought this book yet, stop reading this and just buy it right now. Amazon is sold out but you can purchase a copy here. There is also kindle and nook versions, so you have no excuse. Anyway, onto the review. I have read my fair share of Disney bios and memoirs, but "It's Kind of a Cute Story" by Rolly Crump and Jeff Heimbuch is one of the best. In the book Rolly describes the various projects he did for Disney and you learn a lot about his relationship with Walt. Rolly and Jeff do a great job of telling you what it was like to work for Walt without glorifying him too much or making him sounds like a tyrant. Plus, if you've ever wondered what happened to the Tower of the Four Winds after the World's Fair you'll find out in this book. 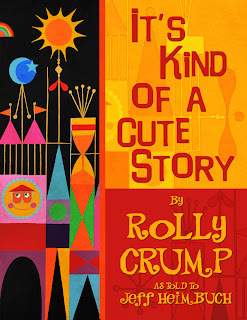 Any book that mentions Mary Blair is worth reading, and Rolly has some great stories about her. I was amazed to hear about some of the incredible attractions he worked on outside of Disney. Did you know Rolly Crump designed the Ernie Ball logo? I don't want to give everything away, but his post Disney career is just as exciting. Amazon adventures, naked women, this book has it all! I did not want to put this book down, it's full of wonderful (or should I say cute) stories from one of Disney's greatest Imagineers. Buy it on your ereader now while you wait for the Hardback signed limited edition copy to be released. You'll be glad you did! Since we are getting into the Holiday season, I suppose it's about time I talked about the Disney Christmas Parade. When I was accepted into the College Program one of the things I was most excited abut was going to The Magic Kingdom on Christmas Day. 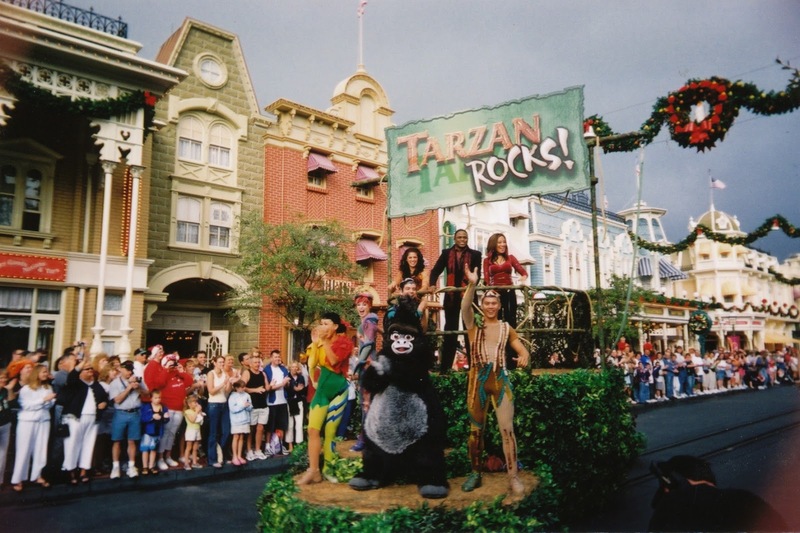 As a kid I always watched the Disney Christmas Parade and thought about how great it would be to see it live. You can imagine my shock when the first week in December the CP Newsletter announced they needed extras for the parade taping. That's when I realized....They don't actually film the parade of Christmas Day. This was 2003 before the boom of social media, I didn't get my news from the internet, so there was really no reason for me to think the parade was filmed on any day but Christmas. Anyway, back to the story. The taping was done over 3 days. 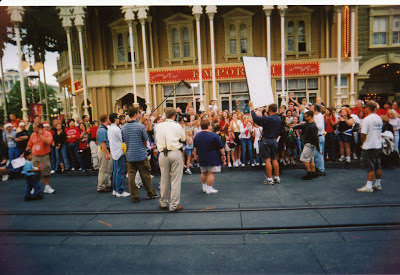 The first was an early day when only Cast Members could sign up. We met at the Magic Kingdom before the park opened and were taken to Exhibition Hall where they put us in groups and explained what was going to happen. On our way in a manager stopped me and asked if I needed help. It seemed strange to me since everyone walking in was a Cast Member, so I said "Oh, I just need to buy some film (because it was 2003 and people still used film)." She looked confused "Oh....well, uh, we are having an event right now and..uh" She saw me start to laugh and realized I was messing with her. She jokingly said "I hope you don't end up in m group." Naturally, I made sure I was. Her name was Cathy, and she was one of the managers at the Emporium. As she walked us to our spot on Main Street for the taping, I caught up with her and asked who we were going to see. She pulled out a slip of paper and read off "Wayne Brady and Disney Channel Stars." I asked "IS CHRISTY ROMANO GOING TO BE HERE?!" She looked down her list, yes she was. I told Cathy that I had to meet her. She promised to do her best to help me and I took my spot on Main Street. My roommates and I stood across from the Emporium, this was our view. Things started to get underway. The first float was Wayne Brady, he rode down Main Street singing "You'll be in my Heart" from Tarzan. When he reached the end (or beginning) of Main Street the music and his float stopped. Alright, I thought, who's next. The float then reversed back to it's starting point and he started over. If I had to guess I'd say that we heard Wayne Brady sing that 40 second clip 6 times. He came over to our section to film some "We'll be right back" segments holding a baby that was in the crowd. Then he left, time for the Disney Channel Stars. 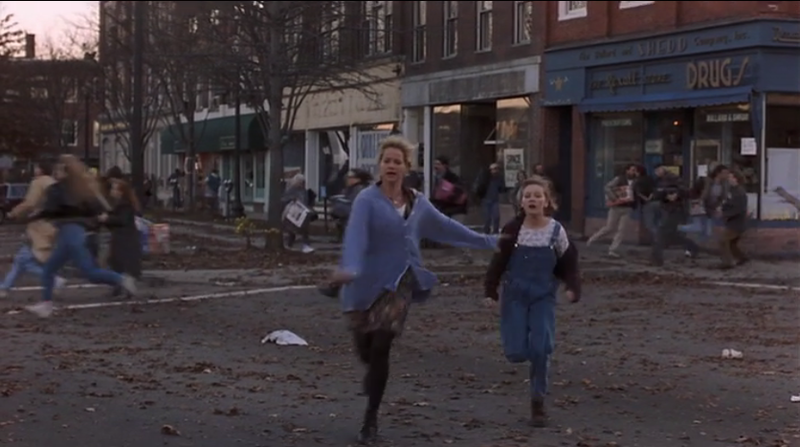 The Disney Channel kids didn't have a float, they just walked down a short section of Main Street singing a song. They consisted of the "That's So Raven" cast and Christy Carlson Romano (Star of Even Steven's and voice of Kim Possible." They didn't take as long as Wayne Brady (which is probably why I don't remember what they sang). 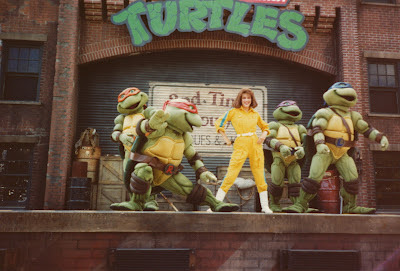 They also filmed some promo shots across the street from us. 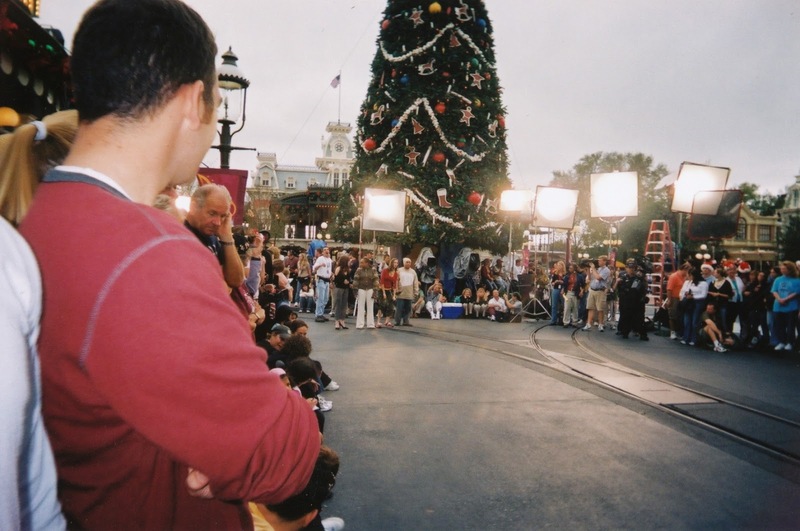 After they finished their taping, Christy and the other Disney Channel kids were hanging out in a roped off area by the Christmas tree. I went over to Cathy and said "That's her!" Cathy went over to Christy and said "There is a guy over here who would like to meet you." and what do you know, she came right over to me. Before I tell you about this part though I need to explain a few things. My coworker, Dan (a different Dan) and I had just bought these children's sized Disney Channel shirts. I had Kim Possible and he had Lizzy Maguire. We also thought it would be a good idea to get our hair cut at Walmart, this resulted in me having to shave my hair as short as possible to correct the atrocity. So, Christy comes up to me, compliments my shirt and we take this amazing picture together. Do I need to point out how excited she looks in my picture compared to Dan's?? That was pretty much the end of day one. I was going to write about all 3 days in this one post, but it's already pretty long so I'll save it for tomorrow. When you're a CP without a car the parks are pretty much your only day off destination (not that I had a problem with that). The downside of that being, after riding the Tower of Terror multiple times a week, the thrill is gone. My roommates and I came up with a solution to this and we called it the Seat Belt Scam. What we did was this; when we sat in our row we would pull out all the slack from our seat belts. We would then buckle them and sit on the slack. After the doors closed and the ride started we would wait till we reached the first drop and get off the slack. When the ride dropped we would hold the seat belt out as far as it would go and jump off the seat, this way we would fly out of the seat as high as the seatbelt. When the ride was over we would let go of the slack and the seatbelt would retract back in to the appropriate level of restraint. This was enough thrill for us, until my friend Steven came to visit and gave a whole new meaning to "Seat Belt Scam." We had told Steven about the Seat Belt Scam and he was anxious to try it out. We were seated in the back row and Steven was given the middle aisle spot, which was perfect for what he had in mind. We all sat down and pulled out our seat belts waiting for the ride to start. When it did, Steven took his shirt off (which was something he would do on Test Track as a single rider to see the reaction of the strangers he was riding with). As we approached the drop Steven slipped out of his seat belt. As he did this, the seat belt retracted. 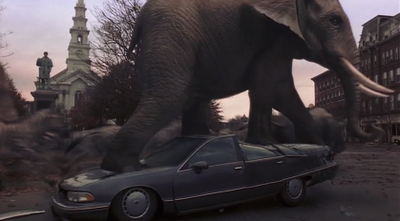 This was why we always held onto the slack at the end of the seat belt, once you let it go, you can not get it back. Even if he wanted to, Steven wasn't getting back into his seat belt. The doors opened, light flooded the elevator car and there was Steven standing in the aisle, shirtless and without a seat belt. I'm sure the other riders were terrified for him. Before the car dropped, Steven grabbed ahold of the metal ceiling grate. We all watched as he lifted his legs up, hanging from the ceiling as the ride dropped. He did this at every drop, jumping up and down laughing wildly. Needless to say, it made our Seat Belt Scam look like child's play. The ride ended and Steven realized he couldn't squirm his way back into his seat belt. He put his shirt back on and sat back down placing his hand over his stomach to hide the fact that he had no seat belt on. The rest of the car just looked at him in shock. When the doors opened, we knew he was in trouble. Waiting at the exit were 2 Disney officials in suits and a Tower of Terror Cast Member. As we all walked off the ride one of them asked to speak to Steven. Steven sensing he was in trouble said "I'm glad your here, I'd like to register a complaint." He then started to go off about how he had a faulty seat belt. The managers (or whoever they were) obviously weren't buying it. "How did your shirt come off?" they asked him. He told them it was blown off. Surprisingly, he was not forced to leave the park. He was told that if they ever caught him doing it again he would be asked to leave. Steven still maintaining his faulty seat belt alibi assured them that he would not be riding the Tower of Terror again. While Steven was talking to the Disney authorities, the rest of us stood at a safe distance and listened. When he rejoined the group we all ran to the photo area hoping to see the picture of a shirtless Steven hanging like a monkey from the ceiling. Unfortunately, the powers that be decided that our photo was "Lost in the Twilight Zone." Last time we looked at documents from Walt's FBI file that dealt with the various film and television specials. Today we will look at correspondences between the Disney family and J. Edgar Hoover. The first is one Walt sent to Hoover after receiving a congratulatory letter about his Milestone Award. Here is an exchange between Walt and Hoover discussing the FBI's cooperation with Walt's news reels. Here is an interesting one where someone suggests that Hoover send an autographed copy of his book Master of Deceit to Walt. Hoover listened, because here is Walt's reply. The FBI took great interest in Walt's death. They clipped his obituary and Hoover even sent a sympathy letter to Lillian (not before a memo requested he do so first). The letter suggesting Hoover contact Lillian. I find the letter to Lillian very interesting, especially the note at the bottom. Walt being a Special Correspondent on a first name basis. They even kept record of his funeral. Walt and Lillian weren't the only Disney's who received a letter from Hoover. Here is one he sent Roy after meeting him in DC. he even sent along a photo of them together (not shown in the file). About six years ago I read Hollywood's Dark Prince, the most ridiculous of all Walt Disney biographies. It's actually worth reading just for the outrageous claims Marc Eliot makes. Just to give you an idea, the book says Flora was not Walt's mother, he was the illegitimate child of Elias and a mexican woman. Walt hid this whole life by hiring her as his house keeper. One of the biggest "revelations" though is that Walt secretly worked for the FBI giving them names of communists in Hollywood. The book has a few photos from pages of Walt's FBI file to back up the claim. Well, after reading the book I decided to get a copy of his FBI file myself. Thanks to the Freedom of Information Act (FOIA) getting a copy of a persons FBI file is pretty easy. I made the request with FOIA and explained why I wanted to see the file. About 3 months later they replied saying that my request was approved; all I needed to do was pay them $15. Another 3 months went by, they confirmed that I had paid and about a month later I received a CD-R in the mail. Inside a blank card board sleeve where someone had written Disney,Walt were 2 PDF files containing the 495 pages of Walt's FBI file. The first PDF mainly discusses The Mickey Mouse Club wanting to tape a news reel segment in DC. The quality is pretty bad. Most of the pages look like they were scanned, then photocopied and scanned again. There are also a good number of pages that are completely blacked out, but I'm getting ahead of myself. Here's one of the pages on the Mickey Mouse Club. One film the FBI was very interested in was Moon Pilot. There are dozens of pages of correspondence about this film and cut outs from multiple news paper reviews. I wonder what was said here that they needed to black out. Funny how after it mentions UFO's and J. Edgar Hoover we are not allowed to read anything else. The above entry details a conversation Walt had with an agent where Walt volunteers to make educational films about avoiding strangers and things of that nature. 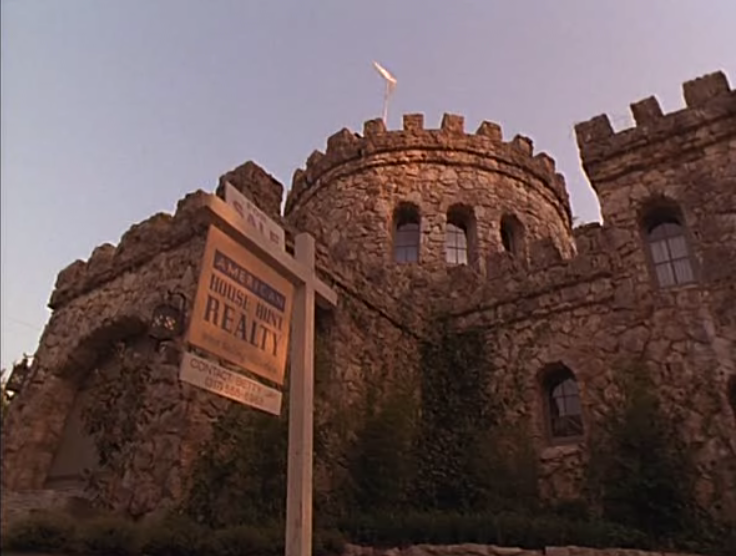 The way the agent describes it in the beginning though makes it sound like Walt had a real interest in a recent child murder. There are also a few FBI memos discussing if the Bureau should accept Walt's invitation to the opening of Disneyland. I do find it interesting that the FBI lists Walt as an SAC contact. SAC standing for "Special Agent in Charge." Did Hollywood's Dark Prince get something right? Was Walt really an FBI informant? In Part 2 we will look at Walt's correspondence with J. Edgar Hoover! 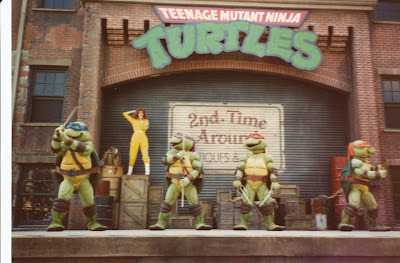 MGM Studios Ninja Turtles Show. 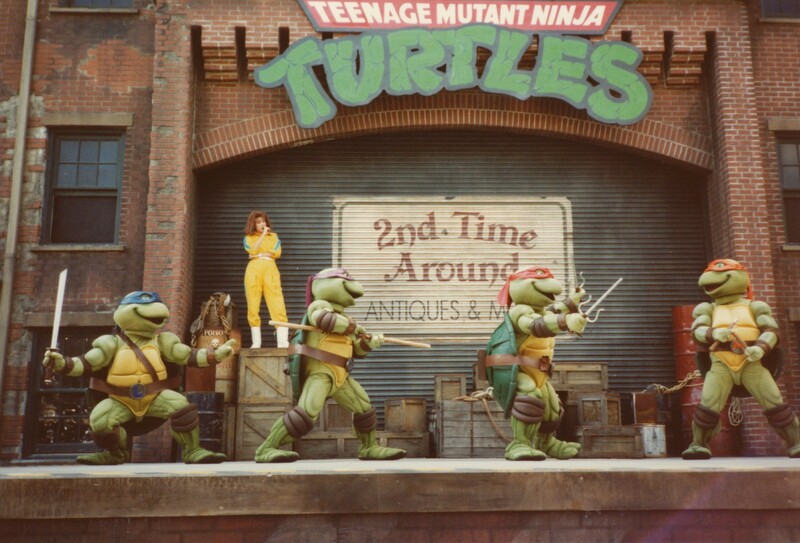 Nickelodeon recently rebooted the Teenage Mutant Ninja Turtle franchise, so what better time to share the pictures I found of the TMNT show at MGM. These are from the summer of 1990. 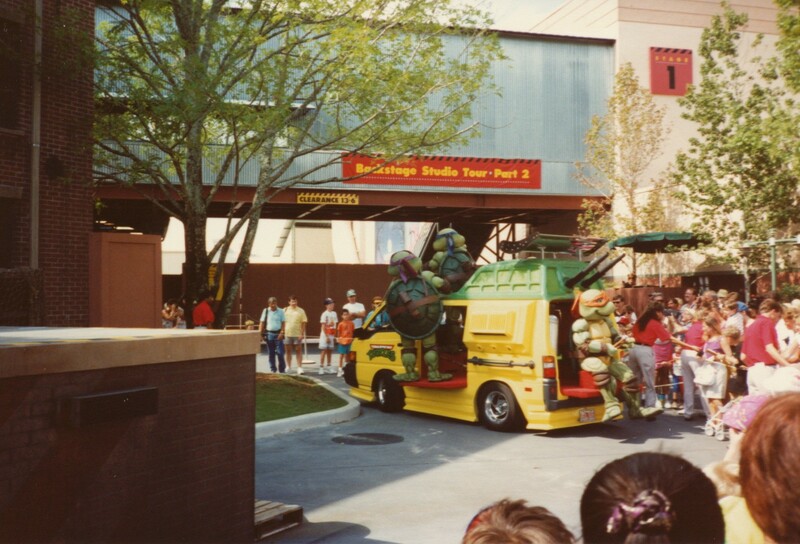 I'd love to know where this Turtle Van is now. I know there is a picture of me somewhere with April, but I'm 99% sure I was wearing a fanny pack, so that one will probably never see the light of day (cut me some slack I was 8). 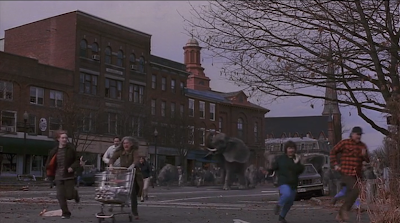 While I was in New Hampshire last week, I stopped in Keene to take some Jumanji comparison shots. Let's start at the beginning of the film. In the opening scene Alan Parrish rides his bike past a statue of his ancestor, Angus Parrish. 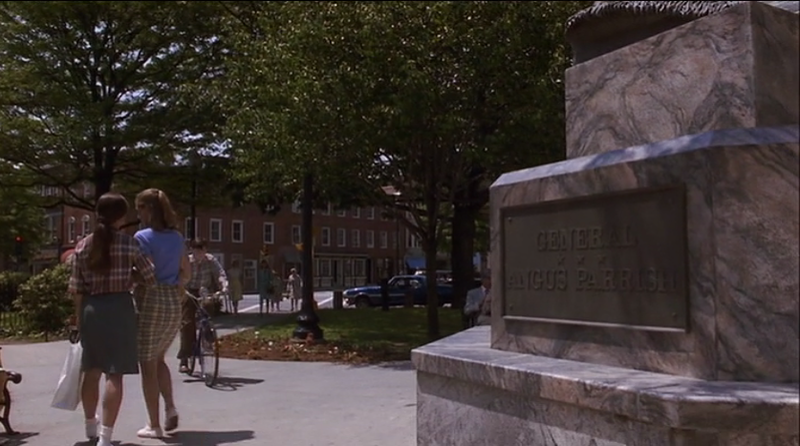 I had been to Keene once before and knew there was a statue in this square, so I assumed they just attached a fake plaque to it, I was wrong. They built the prop statue on top of this rock fountain. Why not just use the existing one? Here's another statue screen shot. It almost looks like they tried to brush out the actual statue in the opening shot from the film. 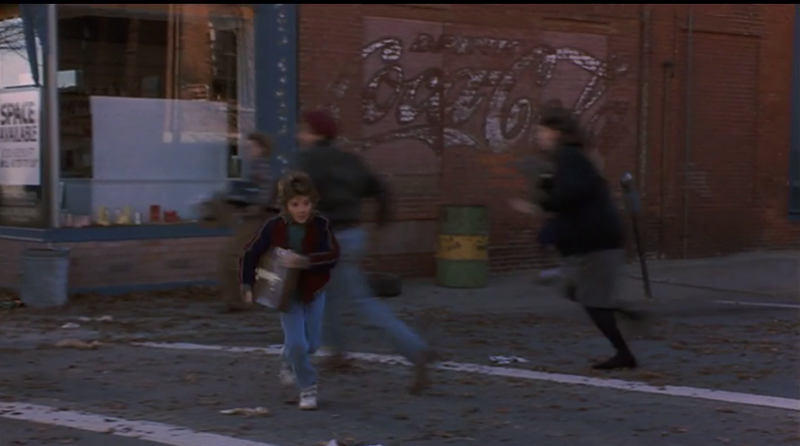 This Parrish shoes ad can be seen briefly in the film and appears in the back ground of the second statue picture I posted. Here it is today. 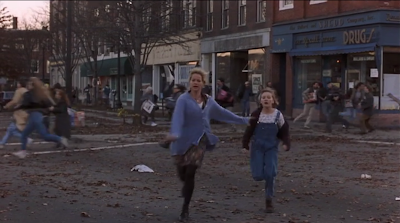 Moving onto the stampede scenes. 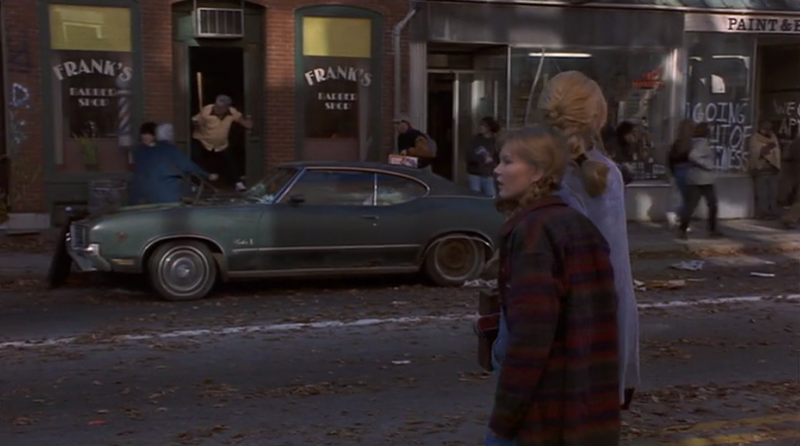 Turns out Frank's Barber Shop is still there too. 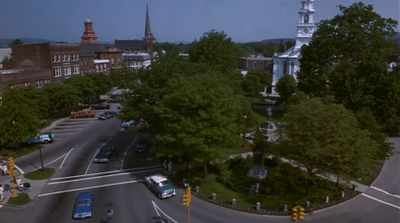 In this shot you can see the statue that's actually in the town square. There is a church back there, the trees are just too full to see it. While trying to solve the mystery of the second statue I came across this website. It contained a photo of the Angus Parrish statue and explained how it was made! 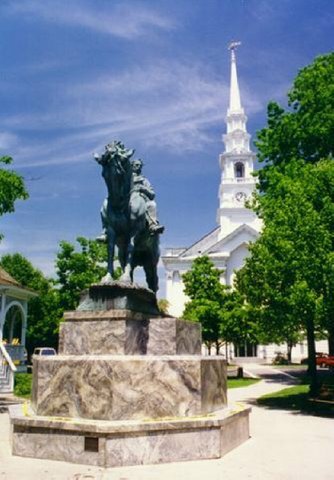 The statue was created and painted to resemble a weathered bronze casting upon a granite pedistal. The statue is actually a closed-cell foam carefully carved and painted to give the effect of weathered bronze. The base is plywood that was painted to match the granite in the existing fountain on Central square. 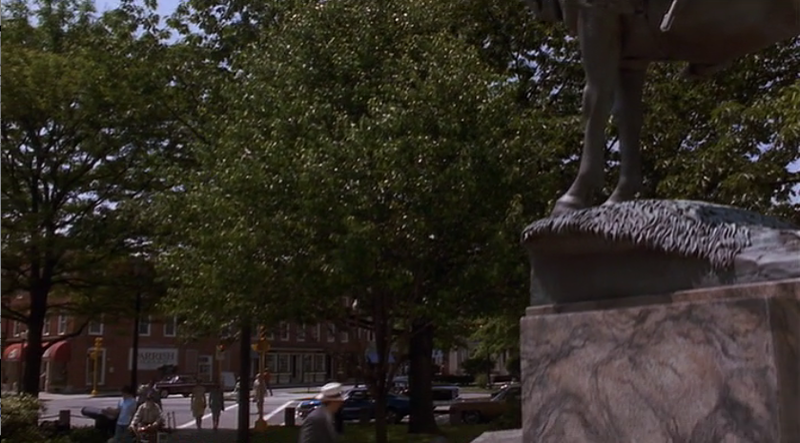 The "statue" was only in place for a few days during the the fall and spring filming. After the filming was completed in Keene, the plywood base and foam statue were essentially given to the city. Both components were being stored at the Colonial Theater the last I knew. Wow, thanks guy! Now I just need to go back to Keene and explore the storage area of the Colonial Theater. When I was in the Walt Disney World College Program I would typically leave work around 1:30 AM, so it was pretty common for me to come home to find all of my roommates sleeping (or at Not So Scary without me). What was uncommon was to find one sleeping on the floor. The lump on the floor was my roommate, Ray, he woke up when I opened the door and said his friend Larry was sleeping on the couch. I said "alright" and went to bed. The Vista Way rules didn't allow over night visitors and Ray hadn't mentioned anyone coming to visit, but it was 2 AM and I really didn't care. Odds are I had probably just ran across I-4 after missing the bus, so sleep was all I cared about. The next morning I met Ray's guest, his name was Larry Lewis. He was an Orlando native, not a CP. Ray had found him wandering around the Vista Way parking lot in some sort of inebriated state and let him sleep on our couch. He had jumped the fence of the neighboring apartment complex looking for a party. I guess Ray slept on the floor to make sure he didn't steal all our valuables (i.e. Miracle Blades) in the night. We found out later that sometime during the night Larry woke up looking for the bathroom and peed on Ray, so it might surprise you to know that Larry ended up living on our couch for about a month. During our time with Larry here is what we knew about him, he was 21 (the 21 tattoo on his leg let us know that), he worked as a salesman at an Orlando car dealership, and that's pretty much it. He was a normal looking guy, kind of "fratty" with a stoners mentality. He lived out of a back pack that contained 2 shirts, and if I remember correctly some cologne. He'd sleep on the couch at night and disappear in the afternoon. Whenever he heard someone at the apartment door he would run and hide in Ray's room, even though we told him it wasn't necessary. After a few days Larry wanted to thank us for the hospitality so he "bought" us some DVD's from the World of Disney store. The first one he brought home was one of his favorites, The Apple Dumpling Gang." Other titles included, Finding Nemo and the live action George of the Jungle. I have no clue how he decided which movies he was going to steal for us (let's face it Larry Lewis was not buying DVD's) but I always found his selections hilarious. His greatest gift though was an awful mini poster from the movie Stuck on You. I came home one day to see it hanging in the living room, Larry was pretty excited "I saw you guys had all these other movie posters, so I got you this one." It was so bad that we had no choice but to leave it up. 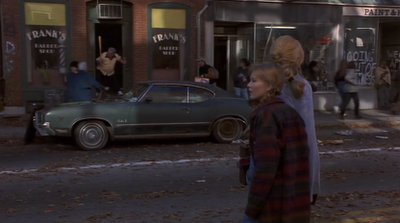 Then as mysteriously as he had appeared, Larry Lewis vanished. He didn't sleep over every night, so at first it was no big deal, his back pack and clothes were still in our living room floor, so we figured he'd come back for then, but he never did. A few weeks later my schedule was altered so that I was working an outdoor food tent for the Festival of the Masters at Downtown Disney. During a lull in business I noticed a familiar figure pass by my tent, it was Larry Lewis, I called out to him. 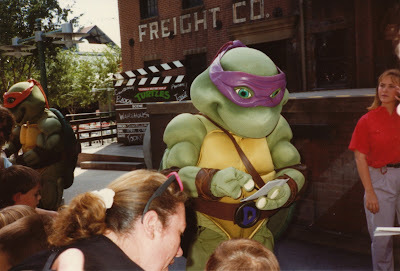 It was no surprise to find him wandering around Downtown Disney, I assumed this is where he went everyday when we went to work. I asked him what was up. He told me he was going down to the AMC to watch "In The Cut" because he heard "Meg Ryan got naked in it." I wished him good luck and he went on his way. That was the last time any of us every saw him. We eventually went through his back pack to see if its contents would answer any of our many questions about him, but all we found were the shirts, cologne, and his social security card (which I still have). I called the dealership he told us he worked for and asked them to speak with Larry Lewis, they told me no one by that name was employed there. After the success of Home Alone movie studios did not waste anytime copying the formula (kid outsmarts bad guys). 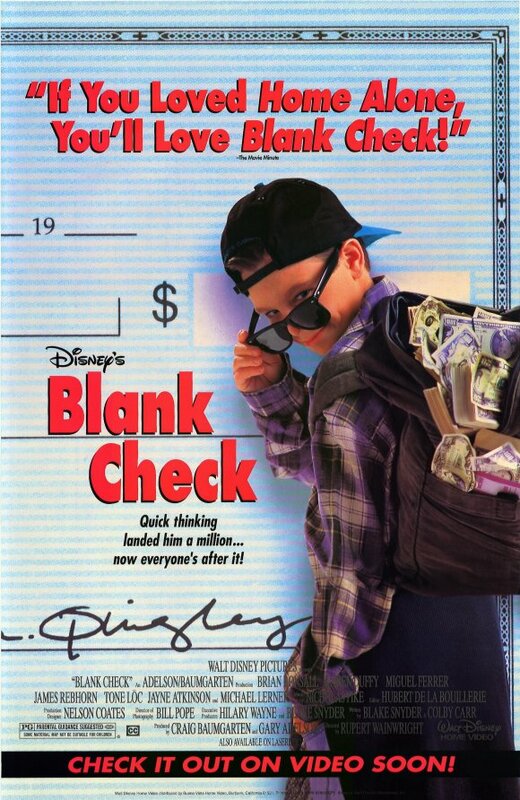 While the worst offender was probably Three Ninjas, Disney was also guilty with Blank Check. They even used it as a selling point! I saw Blank Check in the theater, I remember because it was the only time in my movie going life that the theater manager came out and talked to us about how the movie was filmed in Texas (which is where I live). 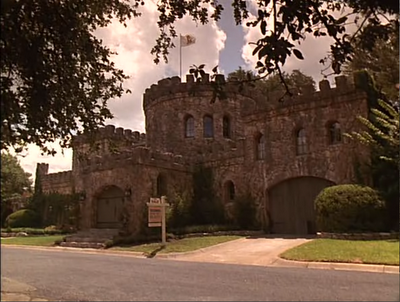 So, on a recent trip to Austin, I stopped by the Blank Check house. As you can see, they've done quite a bit of remodeling. Not to mention the heavy plant growth which makes it almost unrecognizable. The original entry way has been completely removed. I drove around to the side and found the back gate open. 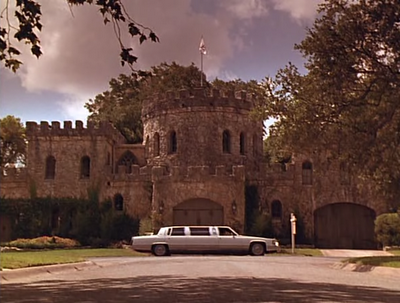 In the film, the back yard had a pool, go cart track, batting cages, and all sorts of bounce houses. The new owners must not have liked the water slide from the bedroom because the whole back yard is torn up. I was hoping the workers would be out so I could ask them for a peek inside. That didn't happen though, this open window was my only glimpse. 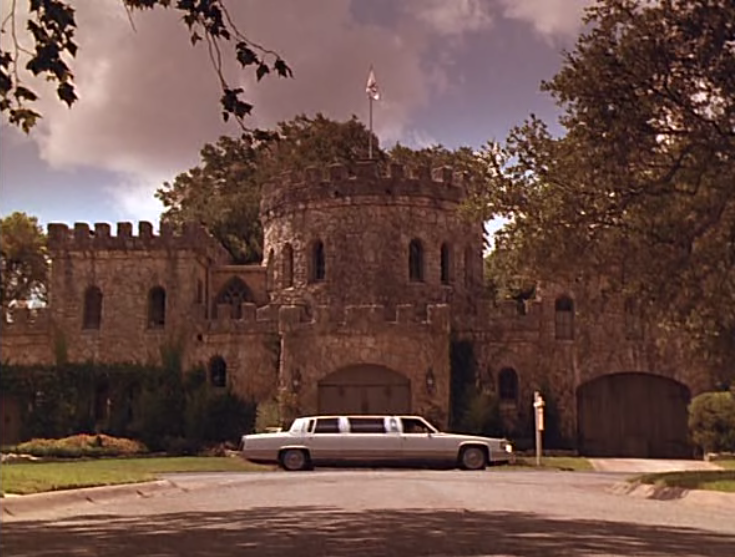 I guess the only thing that has changed more than the house is the actor from the film. Here is a current picture of Brian Bonsall. 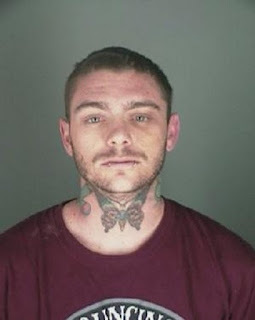 When he isn't out getting neck tattoos, or running from the law, he does a pretty descent acoustic cover of the NOFX classic "Linoleum".